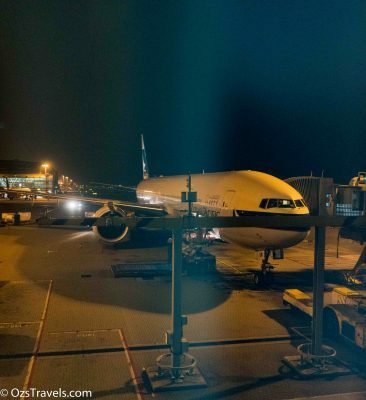 The first leg of my holiday was on CX734, Singapore to Hong Kong, it was a standard economy flight, where nothing interesting happened, unlike my business trip of the previous day when we had a special guest in the economy cabin from Perth to Singapore of QF71. A blind gentleman had bought his very well-behaved seeing-eye yellow Labrador on board. For the entire 5 hour flight the dog never made a sound or moved from their spot in seat 4D-F. This was a first for me! 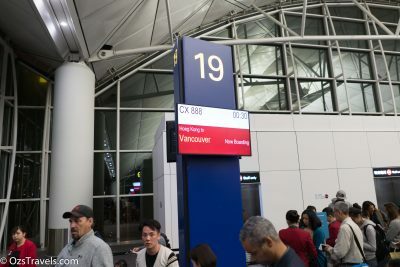 CX888, Hong Kong to Vancouver, was a totally different story to CX734. 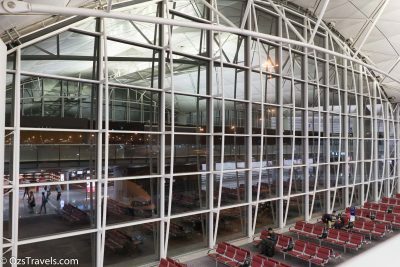 Firstly the Pier First Class Lounge is in a different league to the DNATA Lounge in Terminal 1 of Changi Airport. 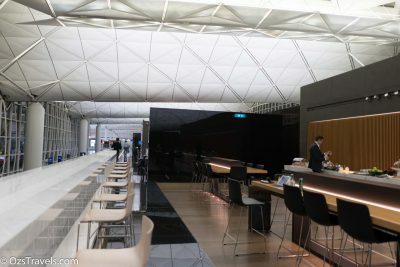 A great place to wait for a flight and enjoy a beverage or three (although I do prefer the Wing, you are right in the middle of aircraft operations and it has very different feel about it, will need to go back to HK and take a few photos). Next up was the flight. 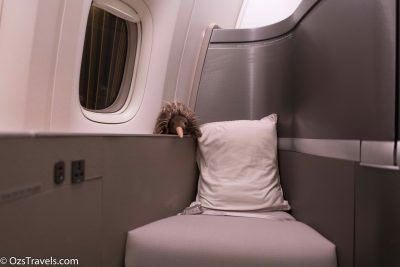 I was lucky enough to have accumulated enough points to be able to book a First Class seat for the 11 hour flight from Hong Kong to Vancouver. My seat was 1a. 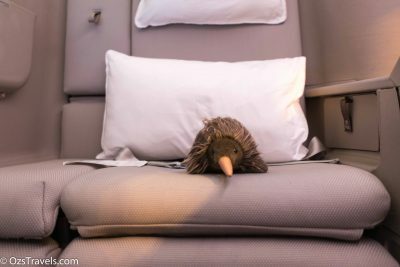 On some Cathay Pacific Boeing 777 aircraft there are 6 First Class seats, which are sort of between a seat and suite. Lots of room, even for my large derriére, heaps of locker space and a largish screen, it was also very comfortable. 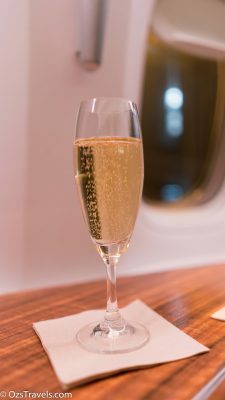 You know you are up the pointy end of the aircraft when you get offered a glass of Champagne before you take off, but you know you are in First Class and on Cathay when that Champagne is a Krug! 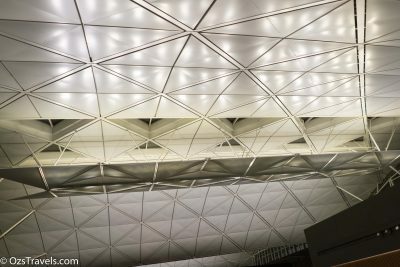 Whilst it was fairly early in the morning, around 1:30am, when the meal service started, I had purposely had a light dinner earlier so that I could try out the Cathay food. 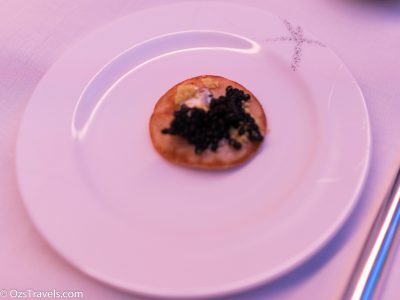 Seemed only natural to start with Caviar and Champagne (don’t want them wasting the Krug). 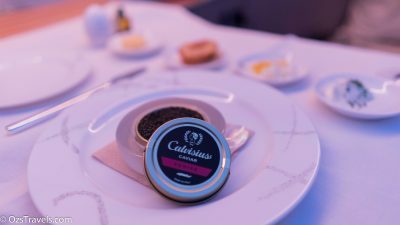 This was my first time tasting Italian Caviar, IMHO it is not as “flavourful” as Iranian Caviar (thanks Emirates), which I quite liked. 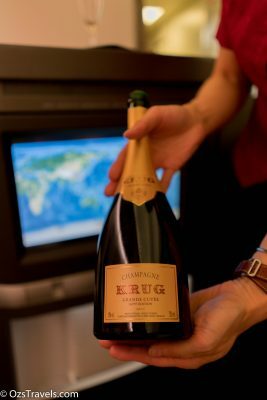 The pairing with Krug was spot on. Guess, I need another glass. 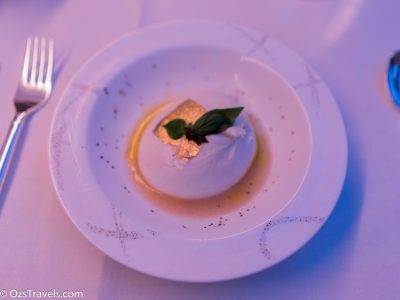 Chef Pino Lavarra’s modern approach to Italian cooking earned a Michelin star for Tosca just 8 months after his appointment in 2013, and it has retained this honor for four consecutive years. 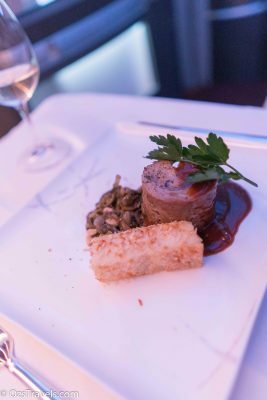 Guests at this elegant restaurant enjoy an enticing menu that takes an innovative approach to classic, flavouful ingredients. With his dedication to continuous refinement. 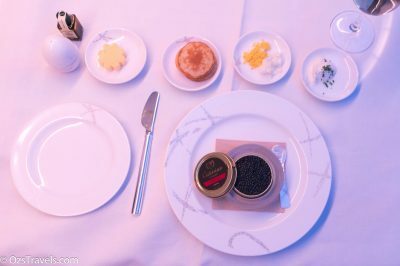 Chef Pino embodies The Ritz-Cartlon’s commitment to “The Art of the Craft” ensuring an unforgettable dining experience. 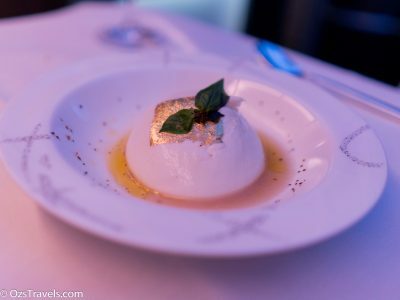 When I saw that they had fresh Burrata on the menu, I just had to try it. Very glad I did. 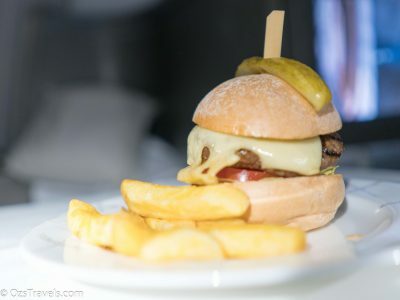 This was extremely good, just the right balance of texture, flavour and creaminess. 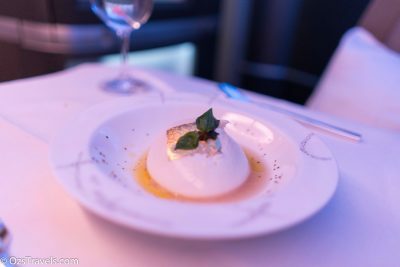 As we were on a flight, the fresh bit is relative, there was no liquid centre as you get with extremely fresh Burrata, but this in no way detracted from the dish. 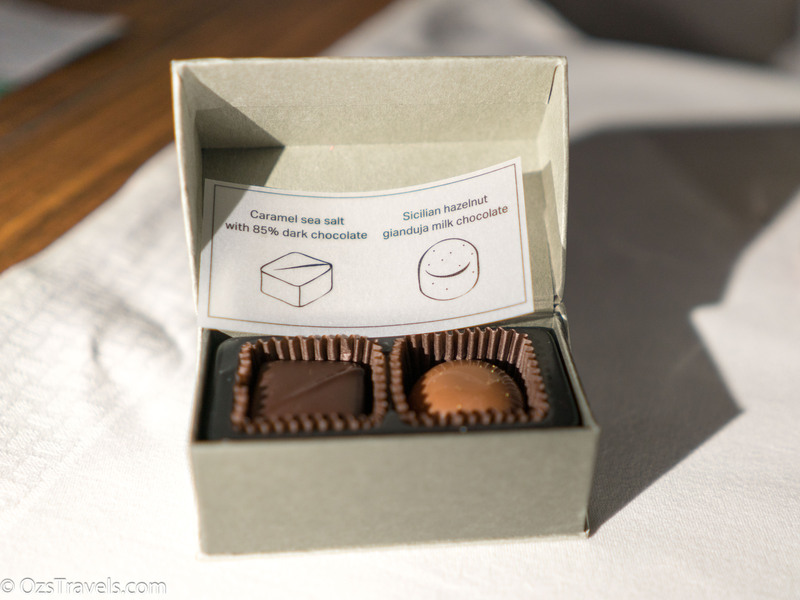 The presentation was excellent, the basil and edible gold enhanced. With the Burrata I decided that a good Australian Riesling was the right wine for me, Cathay are promoting a few Australian wines at the moment. My choice was the Leo Buring Leopold DW20. 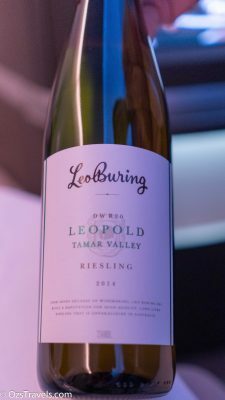 Comment: Young, lots of kero on the nose for a young Riesling, still very enjoyable. Will be interesting to see how this evolves with time. 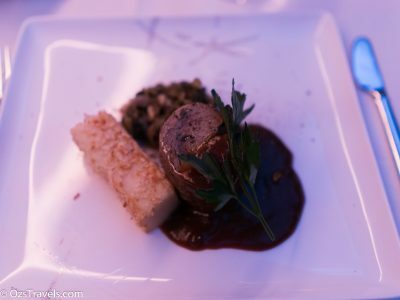 Really enjoyed this, great presentation, nice combination of flavours and texture, just the right portion size. Great stuff! 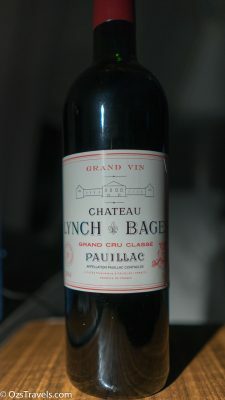 My wine pairing was also Australian, should have gone with the Lynch Bages. Comment: Not bad, but not great. Probably would not select this again if I had the choice, just my opinion. It will improve with age. 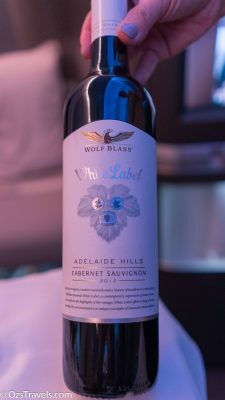 As I was a little disappointed with the Wolf Blass decided to try another red, this time I was pretty happy. Comment: Considering its age, this was still youthful in appearance, but it had evolved very nicely. Great balance, very enjoyable smooth tannins. Would have gone very nicely with the Veal. 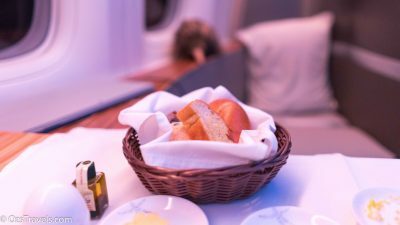 One of the downsides to doing an “overnight” First Class flight is the fact that you are very comfortable and prone to falling asleep, which means you don’t get the time to try a few more wines and an after dinner drink or two. A real first world problem. 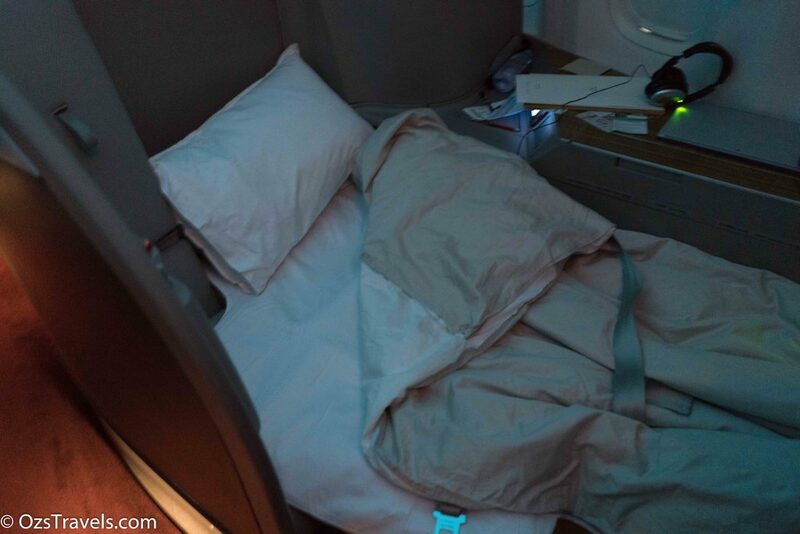 The crew quickly made up my bed for me whilst I was using the spacious (by airline standards) bathroom. I slept very well! 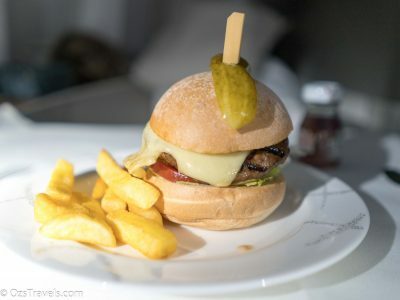 As we were landing at around 9pm Vancouver time, I decided to skip breakfast and have one of the snacks on offer, a burger, was glad that I did. 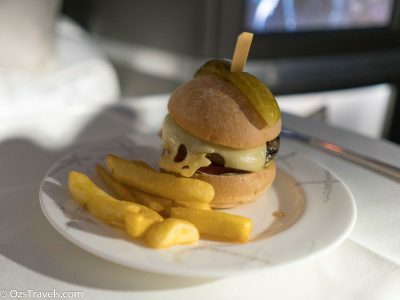 Grilled Australian prime grain fed burger, Swiss cheese and fries – best burger I have ever had at Cruising Altitude. 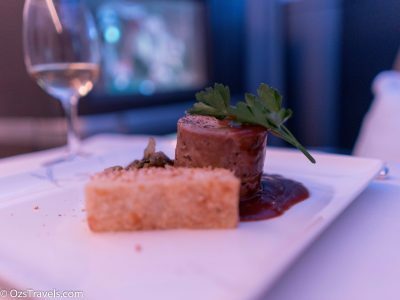 This would have been pretty good with a Shiraz, they had a Wolf Blass St Johns on the flight, but decided that I did not need another drink. 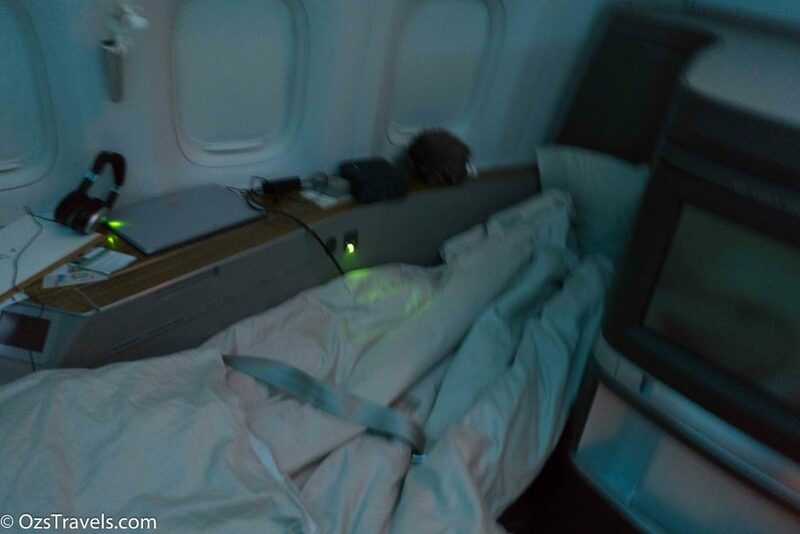 Really enjoyed my flight on CX888, great service, comfortable seat / bed. 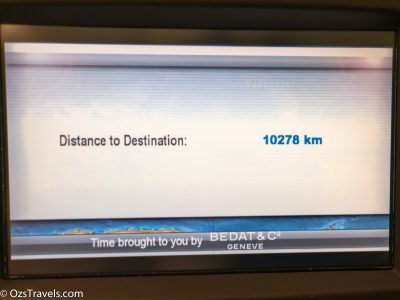 It is not often that you wish that the flight was longer! 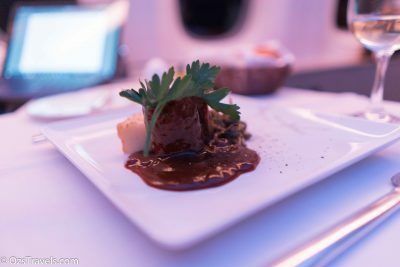 Would like to try this flight again, especially as Cathay are now flying the A350’s on the same route, although they don’t have First Class on the A350. 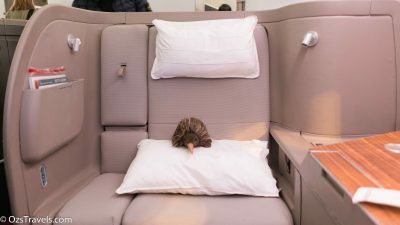 Cathay Business is pretty good, so would be worth it! Sounds like a good idea for another post! 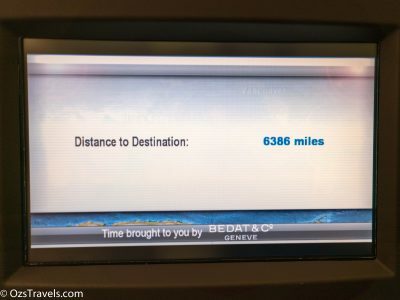 We landed ahead of time and I breezed through immigration, baggage collection and customs, so fast that I beat my friends through arrivals area J. 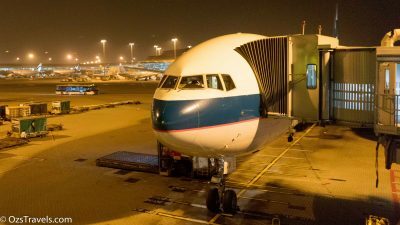 One thing I did notice was that the entire Vancouver airport was closed from a duty free and dinning perspective, something I was not expecting at 9pm on Thursday night. Next up Vancouver / Langley British Columbia. Looks like the very best way to spend 11 hours in the sky! 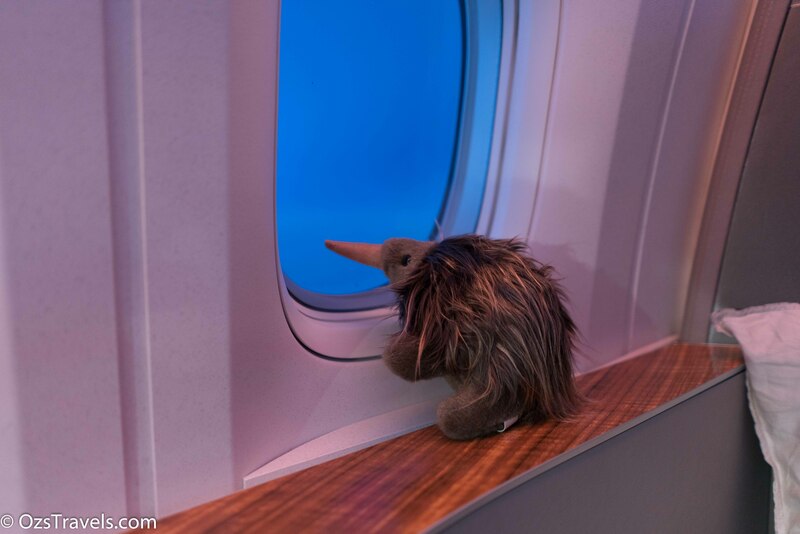 My dad’s retired aviation so we did lots of flying, however, I need to start checking out the Asian flight scene cause it’s definitely evolved into luxury. Happy trails!